The purpose of the issues conference is to identify substantive and significant issues, if any, that require adjudication with regard to the June 2017 draft SPDES permit and the December 2017 draft ASF permit. Please note that participation at the issues conference on July 10, 2018 is limited to Department staff, applicant, and those persons who file either new petitions for full party status or amicus status, or supplements to previously filed petitions, consistent with the requirements outlined in 6 NYCRR part 624. Join a naturalist from Reinstein Woods Nature Preserve to create a house to attract nature's fairies. Once you learn how, you can make one anywhere. For children age 5 to 10. Note: This program takes place at Amherst State Park. In collaboration with the State of New York (Department of Environmental Conservation and New York State Energy Research and Development Authority), BOEM is convening 2 public comment sessions to help ensure that BOEM is aware of the questions or concerns of New York’s fishing community and other stakeholders. BOEM will present information regarding the NY Bight Call for Information and Area Identification process and characterization of NY Bight fisheries. The Town of Brookhaven is co-sponsoring this event. The event will take place at the Town of Brookhaven Beach, south end of Lake Ronkonkoma. This event is geared towards all anglers ages 10 and up who wish to learn about freshwater fishing on Long Island. Loaner rods and bait will be available. Participants are welcome to bring their own fishing gear. Hands-on activities enable families to investigate a different nature topic each session. Note: This program will be held at the Julia Boyer Reinstein Library, 1030 Losson Road, Cheektowaga. Contact the library at 716-668-4991 to register. On this guided walk we will search for ebony jewelwings and tiger swallowtails as well as other dragonflies and butterflies that may be in flight. Note: This program will be held at Billy Wilson Park, Amherst. Registration required; call 716-683-5959. Help remove invasive plants from Reinstein Woods and learn alternative native species to plant instead. For adults and children ages 12 and older. Registration required; call 716-683-5959. DEC has received a Brownfield Cleanup Program (BCP) application and Draft Remedial Investigation Work Plan for a site known as Former Central Dry Cleaners, site ID #C915332. This site is located in the City of Buffalo, within the County of Erie, and is located at 169 West Utica Street. Public comments about the application and draft work plan must be submitted by July 13, 2018. DEC has received a Brownfield Cleanup Program (BCP) application for a site known as 14 Le Count Standard Printing, site ID #C360176. This site is in the City of New Rochelle, within the County of Westchester, and is located at 14 LeCount Pl, 207-211 North Ave, 455-463 Main St. Public comments about the application must be submitted by July 13, 2018. DEC has received a Brownfield Cleanup Program (BCP) application for a site known as American Cleaners Middletown, site ID #C336091. This site is located in the City of Middletown, within the County of Orange, and is located at 360 Route 211 East. Public comments about the application must be submitted by July 13, 2018. DEC has received a Brownfield Cleanup Program (BCP) application for a site known as Hawkeye Trade Center and Residences - 1A, site ID #C828207. This site is located in the City of Rochester, within the County of Monroe, and is located at 1447 St Paul St. Public comments about the application must be submitted by July 13, 2018. DEC has received a Brownfield Cleanup Program (BCP) application for a site known as Hamilton Hill II - Target Area 1 Site, site ID #C447052. This site is located in the City of Schenectady, within the County of Schenectady, and is located at 302-310 Craig St. and 811-831 & 820-840 Albany St. Public comments about the application must be submitted by July 13, 2018. In honor of Thoreau’s birthday, July 12, we will discuss ways of living a simpler life. With so many options, from community sharing websites to recycling your neighbors’ trash, we can all find a simpler and more sustainable way to live. Come prepared to ask questions and be engaged in the conversation. You will get a to-do list pad to take home as an example of what a little effort can do to decrease waste in landfills and simplify your life. Join NYDEC scientist in a hands on experience beach seining at Norrie Point. This is a great introduction into learning about many incredible fish that live in our very own Hudson River. Waders provided, just bring your friends and your love for the river! This program is FREE and open to the public. Learn how to search for and record monarchs at Reinstein Woods or in your own backyard. For adults and children 12 and older. Join us for a guided walk to look for insects and their homes. Insects are essential pollinators and a primary food source for many animals here at Five Rivers. Bring your explorer tools if you have them. You never know what we might find. Are there visitors from outer space in Reinstein Woods? No, just plants and animals that have been introduced from other parts of the world. Join a guided tour to meet some of these alien invaders. This rule making is necessary to reduce the economic burden on New York State licensed lobster harvesters who are unable to take lobsters for four months each year due to the closed seasons in Lobster Management Areas (LMA) 4 and 6. DEC invites the public to comment about a proposed "no further action" remedy related to the Ciba Geigy Main Plant/Pretreatment Plant (Queensbury, Warren Co.). Public comments about the proposal will be accepted through July 16, 2018. A public meeting also will be held to discuss the proposal: June 28, 2018 at 7:00 PM at Queensbury Town Hall -- Senior Center, 742 Bay Road, Queensbury, NY. Project documents can be reviewed at: Crandall Public Library, Attn: Andrea Herman, 251 Glen Street, Glens Falls, NY 12801; phone: 518-792-6508. NYS DEC proposes to repeal 6 NYCRR Part 243, Transport Rule NOx Ozone Season Trading Program, 6 NYCRR Part 244, Transport Rule NOx Annual Trading Program, and 6 NYCRR Part 245, Transport Rule SO2 Trading Program, and replace the rules with 6 NYCRR Part 243, CSAPR NOx Ozone Season Group 2 Trading Program, 6 NYCRR Part 244, CSAPR NOx Annual Trading Program, and 6 NYCRR Part 245, CSAPR SO2 Group 1 Trading Program. NYS DEC is proposing the new rules in order to allocate emission allowances under the United States Environmental Protection Agency's (US EPA) Cross-State Air Pollution Rule (CSAPR) to regulated entities in New York as well as to the New York State Energy Research and Development Authority (NYSERDA). In addition, NYS DEC proposes to make the attendant changes to Part 200, General Provisions. Further, NYS DEC proposes to submit the new Parts 243, 244 and 245 as well as the revisions to Part 200 to US EPA as a revision to the State Implementation Plan (SIP) for New York State. Requests for information and comments related to the SIP revision may be obtained from Robert D. Bielawa, NYSDEC - Division of Air Resources, 625 Broadway, Albany, NY 12233-3251, Phone: (518) 402-8396, E-mail: air.regs@dec.ny.gov. Written statements may be submitted until 5:00 p.m. July 29, 2018. NYS DEC is proposing to revise 6 NYCRR Part 251, CO2 Performance Standards for Major Electric Generating Facilities and 6 NYCRR Part 200, General Provisions. The proposed revisions will establish carbon dioxide (CO2) emissions standards for non-modified existing major electric generating facilities, while leaving unchanged the existing CO2 emission standards for new and modified major electric generating facilities. The proposed revisions to Part 200 will updated incorporated references to federal rules. Written comments on the proposed rule may be submitted until 5:00 p.m. on July 29, 2018 to the contact listed above. Bats are amazing animals but are often misunderstood. Separate fact from fiction, and learn about the only true flying mammals. Registration required; call 716-683-5959. Experience nature at your own pace, and enjoy a leisurely guided walk through the woods. For adults only. The New York State Department of Environmental Conservation (NYS DEC) announces the availability for public review and comment, pursuant to Environmental Conservation Law (ECL) § 3-0301(2)(z), of two guidance documents prepared pursuant to the Community Risk and Resiliency Act (CRRA). By email to: climatechange@dec.ny.gov; please include "CRRA Comments" in the subject line of the email. By mail to NYS DEC, Office of Climate Change, 625 Broadway, Albany, NY 12233-1030. Hands-on activities enable families to investigate a different nature topic each session. Contact the library at 716-668-4991 to register. Discover what amazing animals are lurking underwater on this hike along Ellicott Creek. NYSDEC will host a public availability session to provide information on a recently completed habitat management plan for Happy Valley Wildlife Management Area (WMA) located in the towns of Albion, Williamstown, Parish, and Amboy, Oswego County. The meeting facility is wheelchair accessible. Please contact Adam Perry at 607-753-3095 x240 with any specific requests for accommodations. DEC has received a Brownfield Cleanup Program (BCP) application for a site known as 37-24 & 37-28 30th Street Redevelopment Site, site ID #C241214. This site is located in Long Island City, within the County of Queens, and is located at 37-24 through 37-28 30th Street. Public comments about the application must be submitted by July 20, 2018. A copy of the application and other relevant documents are available at: Queens Library at Long Island City, 37-44 21st Street, Long Island City 11101 --and-- Queens Community Board 1, 45-02 Ditmars Boulevard, LL Suite 1025, Astoria 11105. DEC has received a Brownfield Cleanup Program (BCP) application for a site known as Hawkeye Trade Center and Residences – 1B, site ID #C828208. This site is located in the City of Rochester, within the County of Monroe, and is located at 1447 St Paul St. Public comments about the application must be submitted by July 20, 2018. The Restoration Plan is the result of a settlement of the natural resource damages claim for injury related to the Former GM Tarrytown North site. This plan details guidelines for restoration projects to be done in the surrounding area, affecting the Hudson River and the Pocantico River. The plan will be finalized after a 30 day comment period. The Draft Restoration Plan is available on line at DEC's website. Comments on the Draft Plan will be accepted by the contact listed above until July 20th, 2018. DEC invites the public to comment about a proposed remedy to address contamination related to the 68 Tonawanda Street Site (Buffalo, Erie Co.), within New York's Brownfield Cleanup Program. Public comments about the proposal will be accepted through July 20, 2018. DEC invites the public to comment about a proposed remedy to address contamination related to the Main and Hertel Site (Buffalo, Erie Co.), within New York's Brownfield Cleanup Program. Public comments about the proposal will be accepted through July 21, 2018. Discover the hiding spots of caterpillars in the forest and fields of Reinstein Woods. Join a guided nature walk through the woods. We’ll take a relaxed ramble along the edges of the Vlomankill, enjoying the many sounds of nature: water spilling over rocks, insects and birds calling, the breeze in the branches. We’ll follow the Vlomankill and Fordham’s Crossing trails as they meander in concert with the stream. Search for sparrows in the woods, and learn about the eight species that visit here. For adults and children ages 8 and older. The proposed regulation will ensure public safety and protect natural resources on the Northern Catskill Riparian Areas. This notice will be published in the May 23 issue of the State Register. There will be a 60 day public comment period on the proposed rule beginning May 23 and ending on July 23, 2018. Please submit comments to the contact listed above. Pursuant to Environmental Conservation Law (ECL) sections 13-0307 and 13-0319, the New York State Department of Environmental Conservation (NYS DEC) has filed a Notice of Proposed Rule Making on May 2, 2018 with the New York State Department of State to amend 6 NYCRR Part 41, Sanitary Condition of Shellfish Lands, regulations pertaining to the classification of shellfish growing areas. This proposed rule will classify as uncertified (closed to shellfish harvest) or seasonally uncertified particular shellfishing areas that do not meet the required bacteriological water quality criteria. Areas that meet those criteria will be reclassified as certified (open to shellfish harvest). The following areas are affected by the proposed rule: Hempstead (East) Bay, Long Island Sound (outer Hempstead Harbor), Noyack Creek, Cold Spring Pond, Napeague Bay, Northwest Harbor, Great Peconic Bay, Southold Bay, Orient Harbor, and Little Peconic Bay. This proposed rule is necessary to protect public health. Shellfish areas that do not meet the water quality criteria must be closed to shellfish harvesting to prevent the harvest and consumption of shellfish that may be unsafe for human consumption. This notice was published in issue 21 of the State Register on May 23, 2018. A 60-day public comment period began May 24, 2018. For more information please contact the person listed above. Each summer, the Friends of Five Rivers offers outdoor programs to help parents and children grow in their understanding and appreciation of the natural world through shared activities. Parents or caregivers and children must participate together. Registration is required. Go to www.friendsoffiverivers.org/node/87 for complete information, including fees and a registration form. The Trees for Tribs Grant Program will support efforts to reforest New York's tributaries, or small creeks and streams, which flow into and feed larger rivers and lakes. The goal of the program is to support communities in planting young trees and shrubs along stream corridors, also known as riparian areas, to prevent erosion, increase flood water retention, improve wildlife and stream habitat, as well as protect water quality. Applications are due on September 7, 2018. We are offering a webinar on the grant program on Wednesday, July 25th from 10:00 a.m.-12:00 p.m. During the webinar, staff from NYSDEC's Trees for Tribs program will describe grant program requirements, eligible project types, application evaluation and scoring. Staff from Grants Reform will also demonstrate how to apply for the grant using the Grants Gateway. After you join the webinar, you will be provided instructions to join the audio conference. Take a guided walk to search for seasonal birds. Bring binoculars if you have them. DEC invites the public to comment about a proposed amended decision document, which describes a proposed modification to the cleanup remedy for the Former Cibro Petroleum Terminal Site (Island Park, Nassau Co.), within New York's Brownfield Cleanup Program. Comments about the proposal will be accepted through July 26, 2018. DEC invites the public to comment about a proposed remedy to address contamination related to the Former Buffalo Forge Site (Buffalo, Erie Co.), within New York's Brownfield Cleanup Program. Public comments about the proposal will be accepted through July 26, 2018. DEC invites the public to comment about a proposed expedited cleanup of contamination related to the South Island Apartments Site (Green Island, Albany Co.), within New York's Brownfield Cleanup Program. Public comments about the proposal will be accepted through July 26, 2018. Click the web link at "Additional Information" above to learn about the proposal and how to comment. Enjoy a walk during the full moon as we look for deer in velvet. DEC invites the public to comment about a draft plan to investigate contamination related to the Cohoes/Saratoga Road Site (Cohoes, Albany Co.), within New York's Brownfield Cleanup Program. Public comments about the draft plan will be accepted through July 27, 2018. DEC invites the public to comment about a draft plan to investigate contamination related to the Former Stow Manufacturing Site (Binghamton, Broome Co.), within New York's Brownfield Cleanup Program. Public comments about the draft plan will be accepted through July 27, 2018. 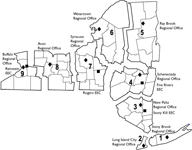 DEC, in conjunction with the New York State Environmental Facilities Corporation (EFC), is offering grants to municipalities to help pay for the initial planning of eligible Clean Water State Revolving Fund (CWSRF) water quality projects. Grant funds can be used to pay for engineering services for the production of an engineering report. Municipalities can apply for the funding through the Consolidated Funding Application (CFA) by July 27, 2018 at 4:00 PM. The Water Quality Improvement Project (WQIP) program is a competitive, reimbursement grant program that funds projects that directly address documented water quality impairments. Applications are accepted through the Consolidated Funding Application (CFA) (leaving DEC's website) before 4:00 PM on July 27, 2018. Minerals sustain us as well as plants and animals. This indoor talk will focus on our dependence on minerals and how life on our planet is recorded in some of the fossils you see at Five Rivers. Guest speaker Richard Hartnett has studied geology and paleontology for many years and has collected fossils and minerals from all over the world. He is a former member of the Boston Mineral Club, a past president of the Capital District Mineral Club, and a current member of the Southwest Vermont Mineral Club. He has also led field collecting trips throughout the region. Search for seasonal wildflowers, and learn their uses and folklore. For adults and children ages 10 and older. DEC has received a Brownfield Cleanup Program (BCP) application and Draft Remedial Investigation and IRM Work Plans for a site known as 11075 Walden Avenue, site ID #C915333. This site is located in the Town of Alden, within the County of Erie, and is located at 11075 Walden Avenue. Public comments about the application and draft work plans must be submitted by July 29, 2018. Legislator Ed Rath and DEC present a community conversation on easy ways to live in peace with our wild neighbors. This event includes a short presentation from DEC and a community wildlife exhibition. Doors open at 6:00 PM and the DEC presentation begins at 6:30 PM.